The retired educator who contributed so much to HISD’s science department that the district named its resource center after her has died. (Francis) Marcile Hollingsworth passed away on Sept. 26, 2014, at the age of 90. Hollingsworth, who joined Team HISD as a science instructor in 1951, devoted 36 years to Houston’s children as a teacher and later as the director of science for all grades. She wrote HISD’s curriculum guides and laboratory manuals for chemistry and physical science, and it was because of her efforts that HISD created its Oceanography Department, which grew into the Living Resource Center. Hollingsworth graduated from the University of Texas at Austin with a bachelor’s degree in chemistry. 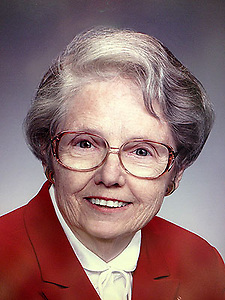 She taught trigonometry to pilots during World War II as an officer in the U.S. Navy and started her civilian teaching career in Mexia, Texas, where she was born. A celebration of Hollingsworth’s life will be held on Sat., Oct. 11 at 2 p.m. at St. Andrews Presbyterian Church, 5308 Buffalo Speedway. In lieu of flowers, contributions may be made to the Houston Museum of Natural Science. This entry was posted in District IX - Wanda Adams, District VII - Anne Sung, Teachers and tagged Marcile Hollingsworth on September 26, 2014 by HISD Communications.